Support Overlay and Underlay Arts: When enabled, options to manipulate overlay and underlay arts are available. Advanced Palette Lists: Lets you switch your palette list to Advanced Palette Lists mode for creating and storing palettes in the Scene or Element Palette List. Restore Current Selected Drawing on Undo: If a drawing other than the current one is being affected by an Undo command, the affected drawing is displayed. Advanced Element Mode: Displays more options in the Add Column dialog box and the Column Properties dialog box. Auto-rename Elements: Controls whether to rename the element whenever the corresponding node name in the Node view or layer name in the Timeline view is changed. Element Node "Animate Using Animation Tools" Default Value: If you know that you prefer to work in the style of version 7.3 or earlier, or if you intend to substitute many drawings throughout your animation, you might wish to deselect this option. This way, you won't have to do it every time (through the Layer Properties) for each new drawing layer that you create. Enable Logging of IO Operations: When enabled, Harmony will create a log of every file operation it performs in a log file in the logs subfolder of the scene folder. Enable Middle Button Pans View: When enabled, clicking and dragging the Drawing or Camera view with the middle mouse button will pan it. Event processing interval while running scripts: When a Harmony script is executed, this setting determines at which interval, in milliseconds, Harmony should pause the script to see if the user attempted to do something, and to respond accordingly. For example, if the setting is set to 1000, and the user starts running a heavy script that takes several seconds to execute, Harmony will pause the execution of the script every second to check if the user pressed any key or clicked on anything, and will respond accordingly, making Harmony responsive despite running a heavy script. This also allows the script debugger to detect if the script has an infinite loop and to interrupt it if needed. The default value of this setting, which is -1, disables the processing of any event while a script is running until the script is fully executed. This means that if a script takes several seconds to execute, Harmony will "hang" until the execution is over. This can cause Harmony to freeze if the script has an infinite loop. However, this has for an advantage that it prevents user action from making any changes or actions that could interfere with the script before it is done running. NOTEDisabling event processing during scripts can be critical when using Master Controllers, as they are often scripted to manipulate elements in the scene in response to user input that refreshes several times per second. If the user input refreshes too quickly for Harmony to fully execute the Master Controller script for every user input, this may cause the execution of the script to be paused recursively. Separate Channels: Displays a simple input field and a function button for each of the Red, Green, Blue and Alpha channels, with a preview of the resulting colour below. Colour Wheel: Displays compact "click and drag" style input fields for the Alpha, Hue, Saturation, Value, Red, Green and Blue channels. The the input fields can be clicked and dragged left and right to decrease or increase their values, or double-clicked to type their value in. Each channel also has a toggle button allowing you to select one of the channels, and to the right is a visual colour picker which allows you to visually pick the value of that selected channel. To the bottom-left is a control to navigate the existing keyframes of the colour functions, as well as add or remove keyframes at the current frame. Compact: Displays a single slider control for the Alpha channel of the colour along with a function button for the alpha channel. To the right are buttons to navigate existing keyframes in the alpha function as well as to add or remove keyframes on the alpha function at the current frame. To select the actual colour, you must double-click on the colour preview to open the colour picker. 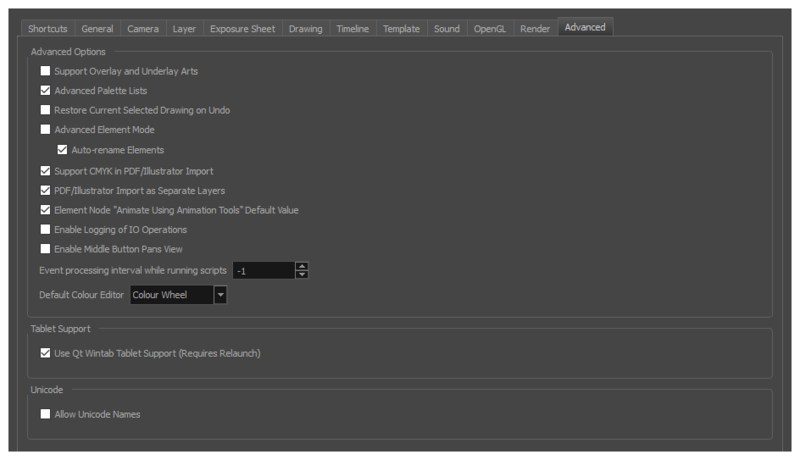 This editor only allows you to animate the alpha value, and hence should not be used if other channels must be animated. TIPIn any of the colour editors, you can double-click on the colour preview to open a Colour Picker dialog, giving you access to more convenient visual controls to select a colour.